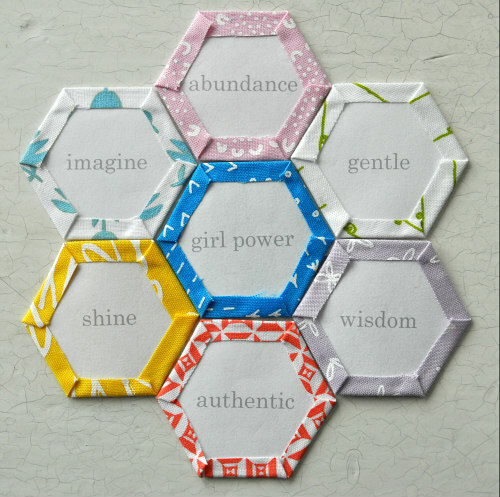 Denise Bell invited me to teach my workshop, and I have to say that I could make an entire post on solely her paper cuttings and fabric pieces! She took the ball and ran so far with it that she might still be running! Denise recently returned from Mobile, Alabama and used the lush vegetation as her inspiration. Of the many layouts and ideas Denise explored, each and every one of them had such a painterly quality and an undeniable liveliness. For me, her work inspires jubilation and celebration. Keep going, Denise! Denise Bell smiling through the entire workshop! Denise made this piece inspired by her recent trip to Mobile, Alabama. 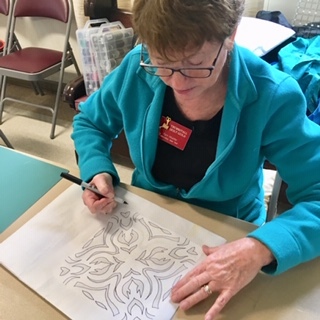 Carol Armstrong used her class time to take one basic motif and apply it to each of the folded papers we reviewed at the top of the class. So industrious, and so inspired! She took a bold step out of the box and began layering her paper cuttings and coming up with compositions for really intriguing pieces. 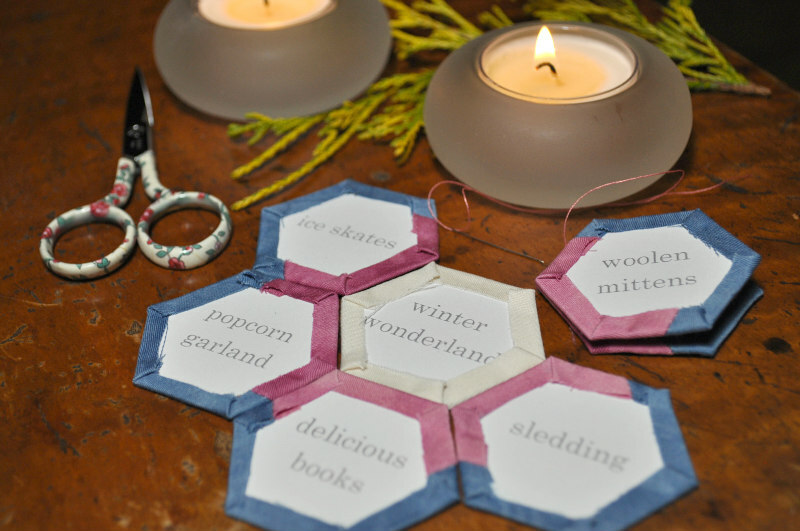 I, for one, will be anxious to see what comes of her paper play! Carol wisely cut several variations on a theme. 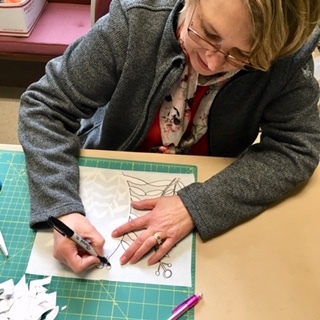 Pam Mueller tracing one of her unique designs. Pam Mueller (right) had a small mountain of paper cuts to choose from and decided on this one for fabric. 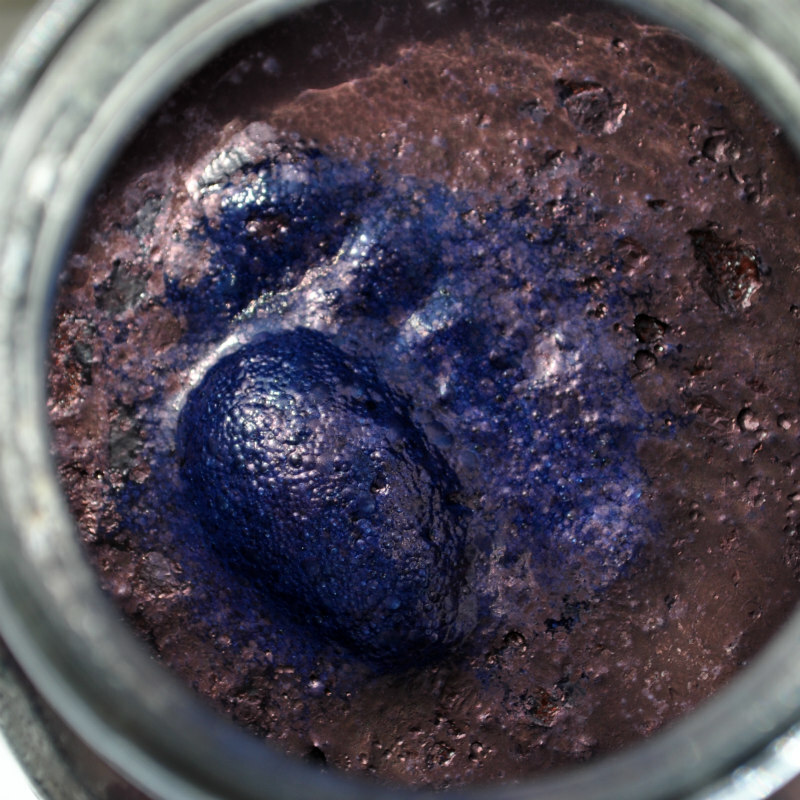 During class, she pulled a turquoise watercolor batik from her stash, which will make for spectacular results! I can’t wait to see Pam’s finished piece! 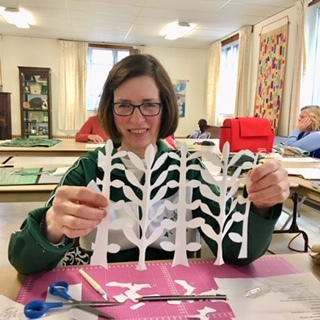 Marion Lutz (below) wowed the room with her gorgeous leaf and stem design! Back at her home studio, Marion continues to make progress. She has big plans for this piece, and all I’ll say is that I already put in my request for a pre-order! It’s going to be so good!! You can find Marion @fauxsister. Marion Lutz tracing her lovely design. Marion Lutz’s original design. Stunning! Camille DiSanza took one of my Flower templates and enlarged it free hand, then cut the original template from the light green fabric and her enlargement from the dark green. She set out to create a shadow effect and nailed it! She’s a shining example of giving oneself permission to play and letting the magic happen! Camille DiSanza with her fabric panel destined to become a pillow cover. Sue Hopkins traced and fused my Tulips template onto an asian print before fusing it to her table runner. 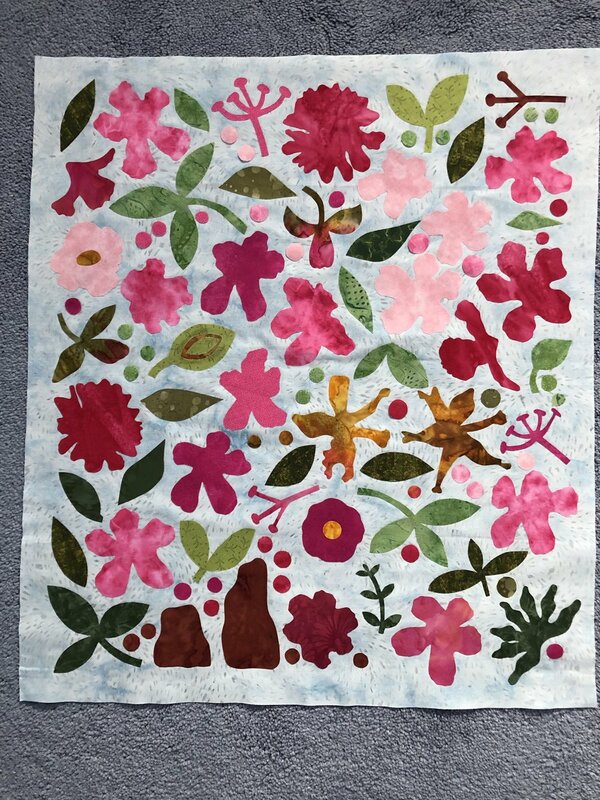 The original table runner pattern had a different flower appliqué, but Sue decided to venture out on her own! Using only the fabric she brought, she cut a total of seven Tulips. She decided to place four Tulips across one end of the runner and three across the other end. I can’t wait to see your finished table runner, Sue! 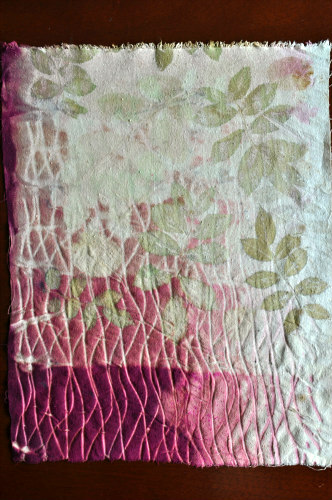 Sue’s fabric choice gave added movement to her Tulips! 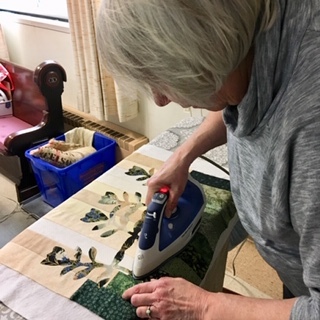 Sue Hopkins fusing Tulips to one end of her table runner. Four Tulips down, three to go! Typically, I offer this workshop as a full day, so I can attest to how hard these women worked in three short hours! When I see the progress and the fun people have, I often feel this should be a multiple day workshop. It would allow for a comprehensive exploration of the process, as well as allow students the space and time to really develop their own ideas and get valuable feeedback from the group. 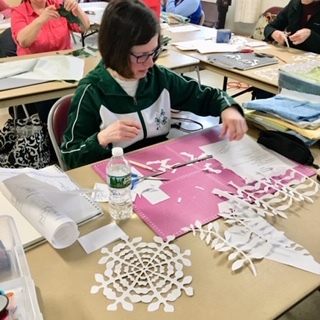 If your guild or quilt group is interested in this paper cutting and fused appliqué workshop, for one day or two days, please email me. It’s a lot of fun, very inspiring and the results around the room are as unique and beautiful as the people creating them. See more of my work on Instagram @tierneybarden. I’d like to thank the Thumbstall Quilt Guild and all of the students shown above for their permission to share their unique work with all of you. As always, I’d love to hear your thoughts and questions below in the comments! 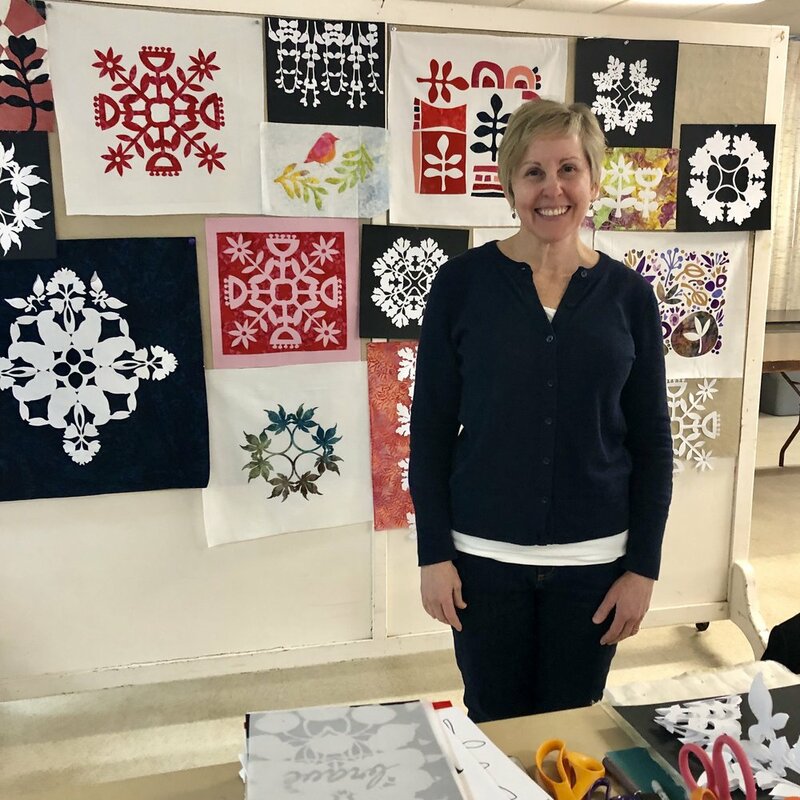 Last week I attended Quilting Connections hosted by the Quilters Consortium of NYS. 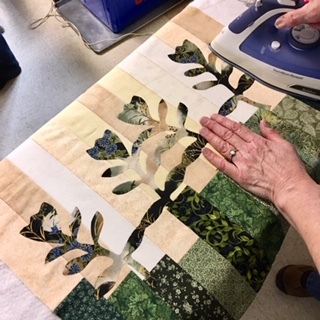 While the Consortium’s main purpose is to provide the ways and means for quilt guilds across the state to network with each other throughout the year, the primary purpose of Quilting Connections is to connect local and national teachers with Program Chairpersons from the quilt guilds. Teachers display their workshops or product offerings and guilds effortlessly fill up their program calendars. It’s a win-win for everyone involved, and the women who organized this event deserve a huge round of applause. They did a stellar job! 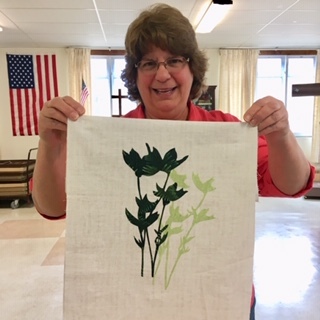 I attended as a teacher, although I’m also a member of the Thumbstall Quilt Guild in Marcellus. I displayed my eco-dye workshop, including the silk piece in the top photo, and I was overwhelmed by the positive response. I’ve updated my workshop calendar, so if your guild, group or shop is interested in this workshop, simply contact me by email here and we’ll set something up! 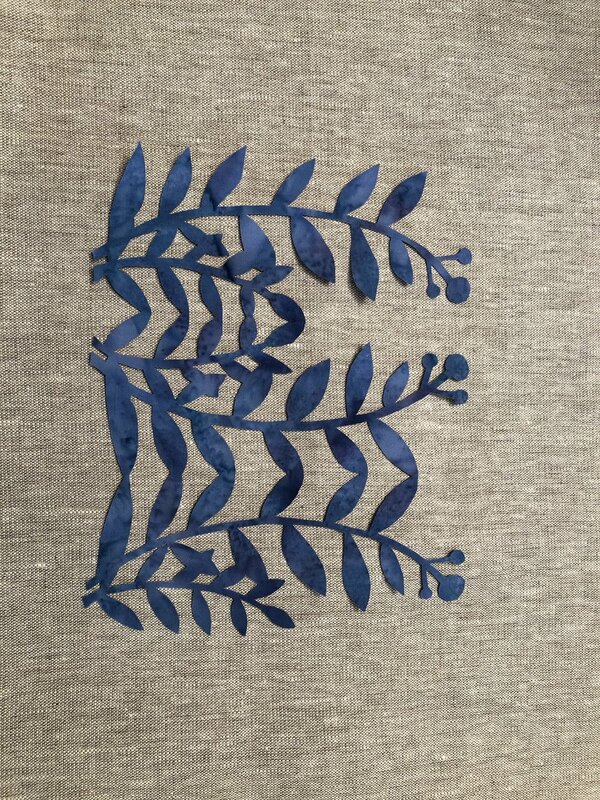 I post a lot of my eco-dye fabrics and projects on my IG feed which you can view here. 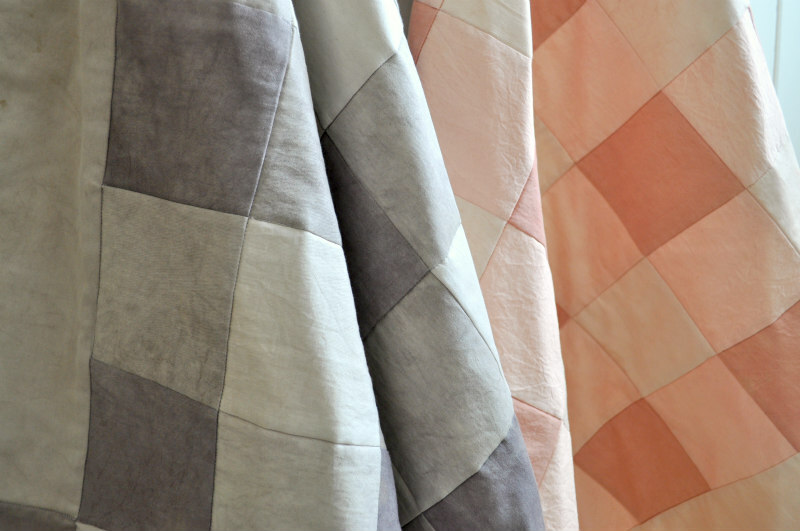 You can also see what other people are making with my naturally dyed fabrics here. Did you ever have a pen pal? I did, and I have fond memories at the age of twelve writing letters to a girl of the same age who lived far away in a tiny country called Sri Lanka. Through letter writing, we exchanged simple details about our every day lives which, over time, afforded me a basic understanding of how, with a little time and effort, a friendship can be forged, even with someone I would likely never meet in person. Each time I wrote to her, I would delight in selecting just the right paper and matching envelope, agonize over which things to write about, followed by the some what ceremonious letter folding, envelope stuffing, sealing and addressing, all punctuated by pasting the stamp. Once the letter was safely mailed off, I’d patiently wait for the day when her letter would appear in our mailbox. Holding an envelope with my name on it was, and still is, exciting! In an age when connecting without the aid of an electronic device seems almost in danger of extinction, I had to share this organization with you. I hope you’ll share it with your family and friends, co-workers and anyone else you think would want to join in this effort. While it’s not a pen-pal experience, it is an opportunity to write a letter giving support to someone in need. Offering words of encouragement, hope and love are at the core of The World Needs More Love Letters. They’re doing something so important, and we have an invitation to join in. If you’re looking for help launching or strengthening your letter writing practice, Lindsey of The Postman’s Knock has an excellent kit that offers everything you need to stay organized and to send off extra special letters. For years, I’ve enjoyed following Lindsey’s beautiful, creative calligraphy business and receiving her inspiring newsletter. You can find a link to her jam-packed kit here: Letter Writers Complete Resource. In writing this post, I got to thinking about the slow food, slow clothing and slow stitching movements and wondered if slow communication is a thing? I know for sure that there is something undeniably special about the love that is poured into a hand written letter. Writing letters has always appealed to the romantic in me, and I hope it always will. If you have a favorite letter writing habit or product, please share in the comments below. I’d love to hear about it! *I’m not compensated for sharing any of the links above. I simply like to share the good stuff in life!